Businesses are now judged not just on the quality of their product, but also how they handle social media. This is the full article on how The Ranch escalated a quality issue into a full blown media issue because they mismanaged the social media aspect. We identify 5 social media mistakes they made and had the experts put together a social media approach that is not done “on the fly”. What’s worse than finding a worm in your steak? The Wednesday before last, Stella Kim and her partner went out to dinner at The Ranch Hotel in North Ryde to celebrate 1000 days together. They both ordered steak. When Stella’s meal arrived, she was horrified to see live maggots crawling on the steak. The couple took a video of the steak, and posted it on Facebook. Hi everyone, I would like to share my horrible experience at The Ranch Hotel, North Ryde on Wednesday night 27th Sep. 2017. We ordered steaks and one of our steak was full of worms. Live worms coming out of the steak. We couldn’t believe this was happening at one of the big restaurant in Australia. Don’t know how many people are affected by this. Here’s a video. Sorry you have to see this. On top of that the Ranch has been deleting our reviews also their whole tab for reviews at their Facebook page has been disappeared recently. I hope NSW Food Authority City of Ryde take some actions to deal with this offensive and disgusting service, as they are putting a lot of diners at risk. I wish no one has to go through this horrible experience. We have lost our appetite. Also Ranch has been saying this happened instantaneously and worm bursted out somewhat like the Big Bang that created our universe. If someone is expert in biology and thermodynamics please review the video so that they are educated on food handling. The story went mini-viral on Facebook with nearly half a million views and over 4000 shares at time of writing, and was picked up by all the major news sites including ABC Online, News, SBS, The Sydney Morning Herald and The Daily Telegraph. Hmm… Good enough? We think not. Flies are pesky things. It’s very hard to keep them out and still allow diners in. And once they’re in, it’s never a great look to have staff chasing a big old blowfly through a restaurant with a swatter or spraying Mortein around, so restaurants generally rely on fans and bug zappers, especially in the kitchens. The bottom line is, it’s basically impossible to guarantee a fly-free restaurant. So let’s give The Ranch the benefit of the doubt and say that, despite their meticulous cleanliness and the best efforts of their highly trained staff, a fly landed on a meal and remained unnoticed long enough for the fly equivalent of the miracle of childbirth. Let’s say that this was a fly that made the best of a brief opportunity and it went straight to the cooked meat. This wasn’t the mistake The Ranch made – it was how they handled the situation after it happened. Once a conversation starts you have two options: join in or stay out of it. The option you don’t have is to be seen trying to stifle it. Ms Kim claims the hotel deleted comments and removed its reviews page. Another commenter said they had deleted his comments from Trip Advisor. That only makes the hotel look like they have something to hide. If the story is out there, join in and tell your side. If your customer has a complaint, answer it. Your customer has maggots on her steak. The only way that it is not your responsibility is if you are claiming she put them there herself. Otherwise, take the blame. Don’t worry about telling us how good your kitchen is, tell us how you’re going to make it better. And whatever you do, don’t talk about the other 262 steaks served without complaint. That only makes me think of other diners eating steaks without noticing the maggots. Ewwww! Speaking of ewwwww, if you see maggots crawling on a steak and it doesn’t gross you out, then something is wrong. There’s no harm in recognising the emotion and empathising with it. The easiest way to get someone on your side is to agree with them. In this case, it seems the lack of empathy may have begun at the initial complaint. From Ms Kim’s Facebook post, it certainly doesn’t appear she was in any way appeased by the hotel’s actions or explanations. Most of the comments that followed The Ranch’s Facebook post were pretty nasty. Many disagreed with the hotel’s explanation of the source of the problem and offered alternative theories. You can read the full comments here, but the most popular idea was that the kitchen staff had cooked the food and left it sitting around for hours before reheating it. Quite a few went so far as to Google the life cycle of flies and state knowledgeably in that fly eggs take between 8 and 24 hours to hatch. That kind of research shows commitment, especially for a comment on a Facebook post. It’s the sort of effort that should have made it clear to The Ranch how seriously their patrons were taking the incident. Over 100 people commented on their response. The Ranch, to date, has met these comment with silence. They’re using the “the best thing to do when you find yourself in a hole is stop digging” approach. What they should be doing is talking to their customers. What was the thorough investigation? Who conducted it? How did they come to their conclusion? By not elaborating on the process, The Ranch left themselves open to criticism and alternative theories. Recently, Aldi had a couple of maggot incidents, with wrigglies being found by separate customers in their chicken tenders and their beef. On both occasions, they hired an independent entomologist to investigate. Did The Ranch’s “thorough investigation” include having anyone independent look at the steak or review the hotel’s food preparation procedure? How much might an entomologist charge to prepare a report? Several hundred dollars? A thousand? Could it possibly be more than the cost to your reputation of having your name blasted across every news site in Australia? “On Wednesday we had a totally disgusting thing happen to one of our guests – she found live maggots on her steak. You may have seen the video on Facebook. When she showed us, we couldn’t believe it, so we wrapped the steak up really well and put it in a fridge in the manager’s office. First thing Thursday morning, we called Dr Joe Bloggs from the University of Western Sydney to take a look. He told us the maggots were from a fly called a Calliphora augur. With this species, the eggs hatch inside the female fly and come out as maggots. A link to his report is here. It appears that the most likely explanation is that a fly landed on the meal between the time that it was plated and when it was served. That’s our fault. We have apologised to the lady affected and offered her some vouchers as compensation, though we think nothing’s ever going to take away that memory. As we all know, it can be really hard to keep pesky flies out. For restaurants, it is even harder as we try to keep flies out while still letting you guys in, especially when we’re serving meals on the outside terrace as we were that night. 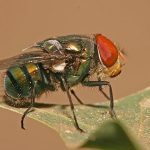 We thought we had it covered but in light of this incident, we’re looking at more ways to improve fly control in the dining and al fresco areas. We’re also reviewing how meals are stored under the heat lamps between plating and service in case this is where the contamination happened.